In my defence, like my writers, I have learnt the art of prioritising the resources at my disposal. Today I am supervising our seventeenth university work placement of the year, signing off this and April’s e-edition, our board minutes, two events for our writing competition’s landmarks, funding applications for two graduate work placements, and making eleventh hour tweaks to our Hay Festival event with Ursula Martin and Hannah Engelkamp (on 31 May, should you wish to come). A colleague from a sister Welsh magazine, supposedly a part-time worker, recently said that her work week averages sixty hours. However, even though I love and am committed to Wales, as my #112 editorial makes plain, I don’t intend to be a martyr to my country. Your letter favours ‘the concerns of the vast majority of the 2.8m people of Wales’ and questions our editions’ ‘clear connexion’ with our nation. The examples you cite are perhaps ill-advised, and, may I politely suggest, even skewed by a privileged position (you do mention previous diplomatic postings around the world). 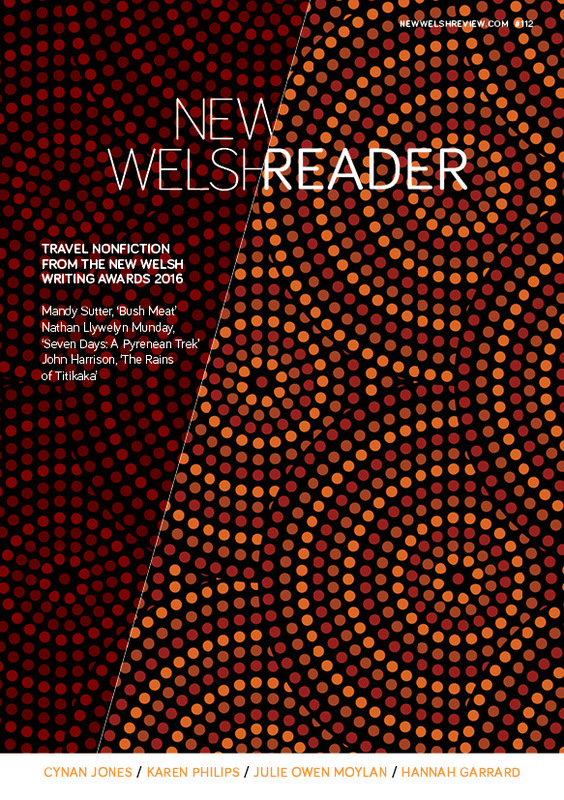 Why would a pregnant Ceredigion girl not be interested in our marvelously written novella extract set in Thirties rural America, and why might its protagonist’s black skin make her experience less relevant to her modern Welsh counterpart? ‘My Oxford’ is the best-written combination of academic rigour and personal anguish in essay form that I’ve ever had the privilege to edit (and it was the subject of much praise from other readers). Additionally, it’s difficult to imagine a more ‘relevant’ subject to contemporary readers than anorexia, a metastasising disorder across both the UK – and in Wales, where the government last year announced an additional £500,000 support. Is it coincidence that the instances you put forward are by female writers, and especially, young ones? I make no apology that my editorship has consistently championed a majority of female contributors. Mr Powell, your letter mentions a need to ‘grapple with the defining issues of our time’. I don’t consider myself a journalist and, perhaps contrary to the days you fondly remember of Robin Reeves’ editorship, we have an insufficient contributors’ budget to pay competitive rates within that industry (our writers’ fees have been frozen since at least early 2011). Only two years ago a commission by me of author Oliver Balch, on business’ social responsibility, was declined by him once I confirmed his fee. I believe in playing to individuals’ strengths rather than being pressured by someone else’s agenda, especially if that conjures a false idea of what a ‘public agenda’ should be. Our remit is for literature. That is where my own strengths lie: in weighing up literary quality within sentences; knowing which upcoming writers are worth keeping an eye on (aside from publishers’ hype), for example our publication of poems and an author process piece by Alys Conran years before she won Wales Books of the Year, grand-slam style. In speaking Welsh, in getting those details of placename and nuance right. In championing Welsh-English translation; in making literature arm-wrestle other artforms, in particular audio, animation and film, in our burgeoning multimedia programme. If all you want is ‘issues’, I respectfully suggest that you stick to the BBC or Wales online. What you’ll get here is added value, which is what literature, curatorship and careful editing injects. In this edition, you may find superficial (or even ‘irrelevant) the idea of a mother struggling with her loss of independence despite her delight in her toddler’s forays into unwitting psycho-geographical territory. You would be wrong, because here you’ll find philosophy, craft and vulnerability. Mr Powell, my personal and work history spans many of the complications your letter raises. Like you, I spent many years (my formative ones) outside this country, and half my siblings still live in England, with the result that their children lost the family’s hard-won Welsh, regained, via the perils of early century Valleys life, by my superbly stubborn father (who was known to speak Welsh to Bradford petrol-pump attendants). I’ve seen first hand how absence from home can ossify notions of what a place should ‘mean’ or be ‘about’. I’ve also worked for book publishing companies whose obsession with sales (mainly in the Valleys) resulted in them bottom-feeding on a Pantomime Welshness of balls (rugby) and more testicles (Z-list ‘selebs’). Over my reviews table I see many English novels for children riddled with Welsh-language mistakes. I’m aware of these subtleties and pitfalls and (and yet?) will always place depth of reading experience and authenticity of feeling above ‘subject’. Perhaps the last word should be left to Cardiff author Joao Morais (of Cape Verdi heritage), who in his Cardiff-set story ‘The Pavement Poet’, published here, challenges what definitions of ‘relevance’ might be. As his refugee protagonist innocently states: ‘But that is not what is poetry. You can read Kahlil Gibran or Shakespeare and if it is poetry it is relevant. Even if it is from a long time ago.’ Even if it’s a black teenage pregnant dropout talking.